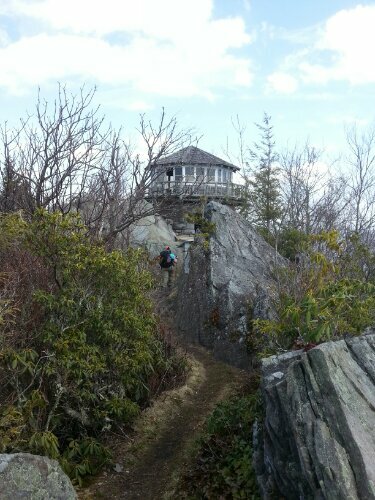 Roan Mountain is the highest point on the AT after Clingman’s Dome until one hits New Hampshire. The shelter has the unsavory reputation of being the coldest shelter on the entire AT as well. Most folks look forward to putting Roan behind them, with good reason. So, we made the absolutely brilliant decision to hike away from a shelter towards Roan on a day where we kept waiting for the ‘rain that should be coming down right now.’ Guess what? Yup, it rained on us for hours once we left the shelter. When we arrived at Roan High Knob shelter we were wet and muddy and the shelter was stuffed with other wet, muddy, smelly people – and the smell of mouse pee. After changing into dry clothes we decided to tent. Despite the fact that the rain stopped an hour before we thought about setting up our tent we were not happy the next morning. After sleeping quite warm and ignoring the howling wind all night we woke up to a frozen nonwonderland. Apparently the howling wind we’d ignored all night was about 10 degrees and laden with sleet. Everything we owned was encapsulated in ice. My shoes had been soaked and coated in mud – they were now also so frozen that it took 10 minutes to wedge my foot into one of them. Jess’s were the same. I went to get our food bags down. The knot in the paracord was too frozen and my fingers stopped working on my first couple of attempts to untie the knots. (Food bags are hung from high branches at night if no cables are available – this prevents a bear from stealing your grub, decidedly something undesirable to occur should your food be stored in your tent with you.) The third time I bashed the knot with a rock until the ice was crushed and I could untie it. The rope was frozen to the branch it was draped over. It would have been funny if I weren’t worried about frostbite from the temperature and wind. After a long while of snatching the rope at different angles and trying to melt the frozen junction with foul language it finally released and I got our bags down. On a normal day I can pack our tent away in 5 or 6 minutes. It took me st least 10 just to get the frozen pole out of the sleeve. Then I had to rub the pole joints until the friction melted them enough to separate and fold. And it took about half an hour to get the frozen tent into its stuff sack. My hands kept giving out. I was seriously worried about frostbite, moreso than the entire time I worked as a freezer selector. Our wet clothes from the previous day had been hung on trees and draped over bushes. Frozen solid. I couldn’t even force my socks to bend. I had to stash them in their frozen shapes. We finally managed to get some breakfast and move out. The wind pursued us down the trail relentlessly. We were the first ones on the trail. 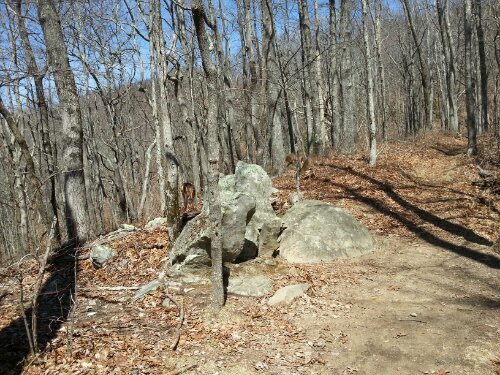 A bit over a mile down the trail we came to Carter’s Gap. It has a parking lot and a restroom so we headed over to try to call for a shuttle out of this hell. Unfun and unsafe. No luck. Verizon offers a lot of false hope. On this occasion as has happened several other times we had 1-4 bars of service but no calls would go through. As we were trying repeatedly to make calls a wonderful thing occurred. Some people pulled a table out of their vehicle and started laying out food. I have to talk about ‘Trail Magic’ for a bit. It’s not magic but it sure does feel magical when you’re on the receiving end. There are kind souls who go out of their way, sometimes incredibly so, to provide snacks and meals and all sorts of supplies and support to hikers. I have had them walk miles of trail just to meet me out on a mountain to hand me a piece of fruit or some candy. The people who do this regularly are often called Trail Angels. These folks had traveled from several states away just to give out food for a weekend. The wind was harsh though. We got a couple of things from them and chatted a bit while privately despairing that we were stuck on this windy mountain and in no shape to hike 14 more miles down it with plastic grocery bags in our shoes keeping our socks separated from our slowly thawing shoe liners. After five minutes one of the ladies produced warm breakfast burritos. Mmmmm. That helped a bit with the shivering. About time that we finished those a consensus was reached among our benefactors that it was too cold, windy and miserable to stay in the parking lot to do their thing. They were going to move to the bottom of the mountain and set up where the trail crosses hwy 19. We begged a ride down with them. Along the way I called Mountain Harbour. They have a hostel and a B&B. The only available spots were the Jefferson room or tenting in the yard. I took the room, despite it being higher than our normal price range. We had heard that this place had a breakfast that is ‘the single best meal on the trail.’ This is where we wanted to be. And we needed a better reset than tenting in the yard. We rolled in about 9:45. It wasn’t even checkout time yet. Shannon, who I had spoken to on the phone, was putting away breakfast leftovers. She found us some plates and made coffee, using the excuse that she wanted a cup. It was awesome. I had a half dozen different things to eat. Despite the fact that check-in is at 3, by 11 we were in our room. The one with a Jacuzzi tub. And a bed so tall that it had (and needed) a ladder. And heated bathroom. And fireplace. Etc. You get the picture. Once we got into the room we went to work on our wet gear and clothes. Laundry was handed over to be washed. My socks clanked when they went into the washer. No joke. Loudly. I heard it in the next room. The tent was set up to dry and gear was spread out in the sun and wind. In the afternoon we took the shuttle that they run daily for supper/resupply. Resupply was very limited. Maybe that was it. Or maybe it was all the calories lost shivering. 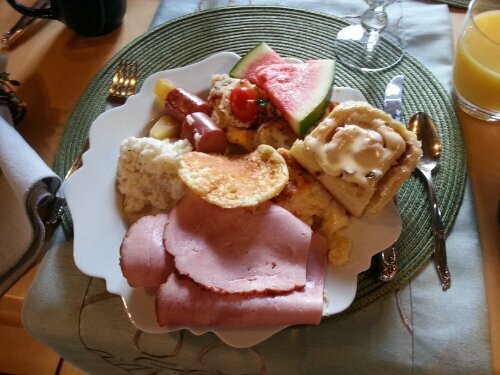 But even after three plates of awesome food at Mountain Harbour I was really hungry. So I ordered the Holy Cow. This is a meal of a burger. 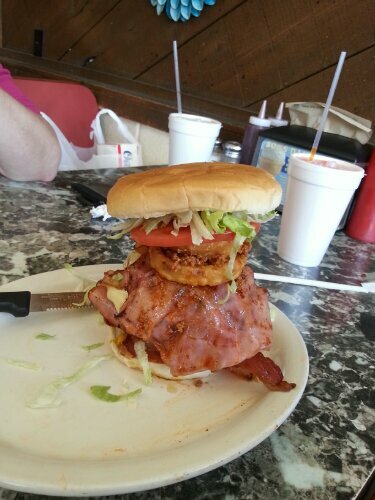 Three patties, three pieces of ham, three slices of cheese, six pieces of bacon, two onion rings, chili, lettuce and tomato. When I got done with the burger I had an ice cream cone for dessert. 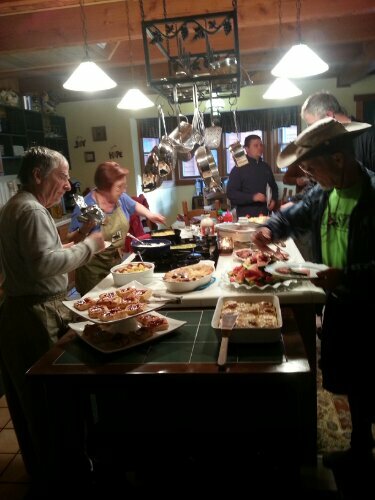 The next morning we got the full breakfast, not just the leftovers. Oh my lord, can Mary cook. No repeated dishes from the previous day and everything was awesome. AGAIN. So I ate four or five heaping plates, had a half dozen glasses of juice and several cups of coffee for good measure. It was the single best meal I have had on the trail. When we shuttled out to resume our trek after breakfast I was fully reset and ready to take on the world. Hot Springs! Hot Springs! Hot Springs! As we neared the end of the Smokies everyone was increasingly excited about the prospect of being done with the park and its plethora of extra rules. The final shelter we stayed in was less than a mile from the park border and pretty trashy as well. It has a chain link fence across the whole front of it (to keep bears out) but the result has been that people go there to feed the bears THROUGH the fence. Which is great and fun until you figure out that you’re out of marshmallows and the bears are still hungry. People are so stupid. The convenient part for us was that Standing Bear Hostel is fairly close to the park border as well. We hiked in there and resupplied with cold goods since we were stoveless due to my mistake the day earlier. The uphill hike after Standing Bear was the toughest we have encountered to date. The temp was up to mid eighties and not a cloud in the sky nor a leaf on a tree. I drank 3 liters in 2 miles. After much moaning and groaning we made it to Brown’s Gap and found awesome treats left by a trail angel: cokes, orange crush and mountain dew. In a cooler, around a table, with lawn chairs. Paradise. And it got better with the bottle of rum I had stashed. We sat around and shared with several other hikers, including some couples we have met: Catnip&PS, Oaks&Sweatpea, and Wetbag&Olive Oil. The conversation turned to Hot Springs. This was our next town and it has a benefit new to northbound hikers; the trail goes through town. Going to town therefore does not take you out of the way at all. Hot Springs has much to offer hikers. A hostel, several hotels, an outfitter, a bar right beside the laundromat, a diner, and of course the hot springs themselves – all on the same street in easy walking distance. As we would enter town on Friday we would also get to experience the weekend. Hot Springs has a kitten pit, much like McDonald’s playgrounds have ball pits. Kitten Friday means all hikers are greeted with complimentary loaner kittens for their stay. There will be a parade on Kitten Friday. The mayor will come out to greet hikers on Kitten Friday. So you may safely surmise that we were all eager to visit the town of Hot Springs. We stayed at Elmer’s. It’s like a B&B for hikers. Historic house, private rooms, great ambiance but a common shower. They offer breakfast and dinner for a price and it’s all vegetarian which is not my normal fare. We had both dinner and breakfast and it was well worth it. I was stuffed at both meals and everything was savory. We made sure to go soak in the springs, of course. Not what I expected but very nice. They have about two dozen hot tub spas and each is surrounded by privacy walls with a view of either the river or the creek. The hot spring water is pumped in just before you arrive, and at the end of your scheduled time the attendant knocks on the door and the water is drained. Clothing is optional, alcohol is allowed, just nothing glass. We took a bottle of wine, poured it into my platy and had a nice cold beverage available during our relaxing time in the tub. The next morning after breakfast we hiked out refreshed, resupplied and happy. I have received a lot of questions and comments about our hike and thought that I should take time to answer some things that seem to be commonly asked. 1. What is the Appalachian Trail? It is a long, public access trail that runs from Springer Mountain in Georgia to Mount Katahdin in Maine. It crosses state, federal and private lands. It is around 2,175 miles long. The actual length changes regularly as parts of the trail are shifted by the people who maintain it. 2. Why would you want to hike that far? It’s both a personal challenge and an indulgence. I enjoy it and I am fortunate enough to be able to do it. You only live once. 3. What about bears? And bandits? You’re packing heat, right? It’s illegal to carry a firearm on some portions of the trail such as Great Smoky Mountains National Park. Also, the trail passes through 14 states. Permits would be nigh impossible. And I wouldn’t carry a gun if you gave it to me along with the permits. Guns are heavy. I am not worried about bears. People taste horrible and most days I smell pretty much like I would taste. Hikers tend to make poor targets for theft since they carry as little as they can get away with, most of which is useful only to hikers. And it takes a special kind of idiot criminal to go climb a mountain in order to steal things from people who don’t carry much and THEN lug said things back to town to sell them, not that anyone would want to buy a bunch if smelly hiker gear. So, no. A gun is not needed at all. 3. What about hunting and fishing and foraging? You live off the land, right? Umm, no. The objective is to hike, not to scrounge around the hilltops like some starving 3rd world refugee and hope that this mushroom isn’t poisonous. Hunting and fishing are fun but the gear is heavy and not really part of hiking. Besides if hikers did live like that we’d ruin the very environment we enjoy to hike through. 4. So what kind of things do you carry? The lightest and best we can find and afford. All of the above varies to individual taste. In total, my pack weight is mid twenties before food and water and usually goes to low thirties when I am fully packed for 5 days or so. 5. How do you keep in touch? Phone and email, though I usually stay in airplane mode to extend battery life. 6. How long does it take to hike the AT? 7. How do you get 6 months off work? You take it. In my case I quit. We are moving after we finish the hike so it was a transitional opportunity that existed. I just had to recognize it and take it. 8. What about the cost? Isn’t it expensive? Depends on your expectations and methods. You can put together food packages and have someone mail them to you so you don’t buy as much along the way. You can also avoid staying in hotels and hostels to save money. You DO have a tent. The average hiker spends between 5 and 10k. That’s cheap compared to what most spend for 6 months of food and lodging. 9. How do you get all this figured out and plan a hike? Learn from others. I suggest reading articles and posts on Whiteblaze.net. Also test your ideas and beliefs. Figure out what works for you. Don’t buy $1000 of gear and never use it until you start hiking. 10. I totally want to go hike the AT. Can I? It’s been done by a blind guy, by people who did it barefoot, by octogenarians, and most any type of person who wanted it badly enough. So, can you? The climb up to Clingman’s Dome was tough. Tougher than we wanted to deal with, frankly. We don’t shirk most things but the ice was dangerous. We made it, though. 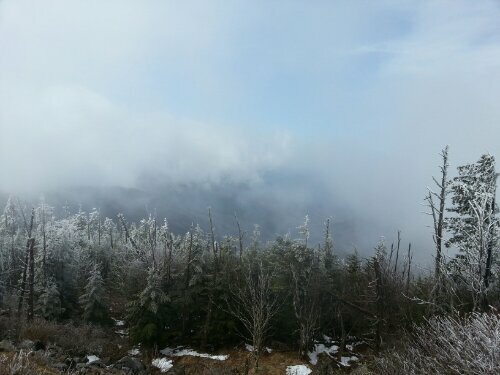 Then the view from the highest point on the AT was nothing but fog. Blech. We tried to call for a shuttle without success. Plenty of signal but our calls would not ring through – thanks Verizon. 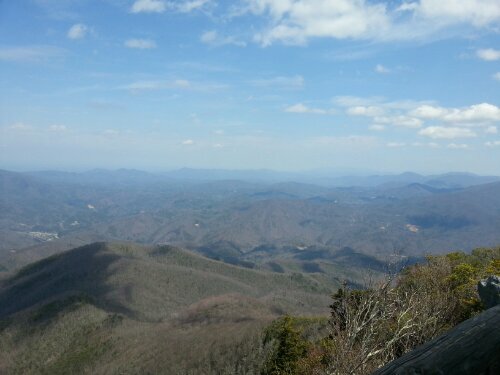 We did hitch a ride with a day hiker down to Newfound Gap. There was a pretty awesome group for our needs hanging out there. First we got fed: Pringles, apples, girl scout cookies, sandwiches and sodas. Then a trail angel drove us to Gatlinburg. I couldn’t believe our luck. Gatlinburg has some wonderful natural beauty. And some interesting garish displays of humanity in obvious contrast. The riverwalk is beautiful and goes for quite some distance. Some of the shops and displays people have built make you think you’ve wandered into some hokey movie set carnival. I should have taken more pictures. Jess (InProgress) found a good deal on Amazon for our ice problem – microspikes with one day shipping for only an extra twenty bucks. So we took an unplanned zero day, bought some booze and relaxed. The next morning we got a shuttle back up to Clingman’s Dome to resume our trek. Much better. The fog lifted so we got a good view. And microspikes are super on trail ice. It’s like having claws or maybe Spider-Man grip. We could walk faster on the icy slopes than our normal pace on terrain without ice. No trekking poles needed. So we made good miles again. I must mention that it was really cold but we were pretty acclimated at this point. To the point of short sleeves and sweating while hiking, even. 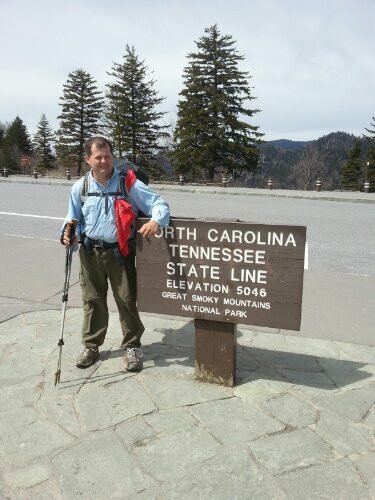 As you hike the ridges and trails through GSMNP you cross from NC into TN and back numerous times. One such crossing was at Newfound Gap. The second day we stayed at Tricorner Nob shelter. It was a mighty wet location. The official water source is a spring that runs across the area just 25 feet in front of the shelter. It had an unofficial branch running 15 feet from the shelter. And there was a big snowbank right at the edge of the shelter. And nowhere flat to tent when the shelter got full. Let’s just say everyone was real friendly. In the morning bustle of breakfast I put the bag with our stove, gas, pot, cups and windscreen over to the side while we ate so someone else could use the cooking space. And there is where it remained when we hiked out. We had a good mileage day. There was a side trail that we felt was a must that added 1.2 miles to our total which took us up to 16; our biggest to date. 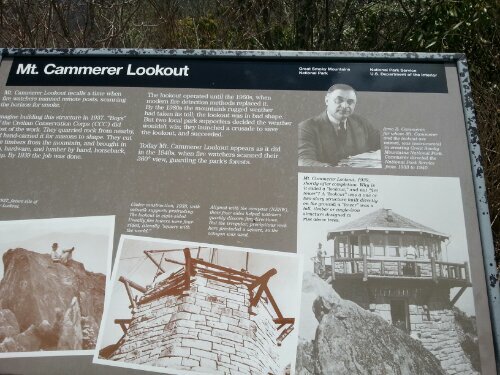 The side trail was Cammerer Mountain and involved some rock scramble to get to a lookout tower but it was totally worth it. We stopped for the day at Davenport Gap shelter, which is only a mile from the park border. Then we discovered the missing gear. Unhappy doesn’t cover it. I might have slept 2 hours that night. We had food that we could eat cold and I can make a fire most any time and we could borrow from others but I LEFT THE STOVE!! After the requisite moodiness and squabble that my mistake incited we hiked on out of the park and went to Standing Bear Hostel for resupply. We found lots of stuff we could eat cold and the menu change was nice. The ascent out of that area was very much NOT though. The temp was quite warm, the sun was out and I drank 2.5 liters in 3 miles. We wished for some ice. Fast forward 2 days of mostly bleh scenery and we are in Hot Springs. The town is small but great. We are at Elmer’s, which is pretty much a bed and breakfast with hiker friendly pricing. The house is huge and dates back to 1840. The meals are vegetarian but really good. We went last night and soaked in the hot springs. Totally worth it, too. Today we push out again. Data connectivity has sucked but I hope that improves so I can post more. Leaves are starting to come out and blooms are occurring at lower elevations so I know good things are coming. We left Fontana and made our way into Great Smoky Mountains National Park (GSMNP). So far it has been long,and tough miles for the first two days. The first shelter is 10 miles along the trail in the park but you have another 2+ miles to deal with just to get to the park. We didn’t leave the lodge until 10 because we were waiting for my sleeping pad to arrive in the mail. Apparently it had arrived RIGHT after we checked in so we were able to get it and hit the trail instead of waiting until the next day which is what we thought we were doing when we woke up that morning. One quick scramble of packing later we got back to it. A couple of miles inside the park we encountered our first large mammals on our trek: deer. Very unafraid of humans. The shelters are very nice but poorly spaced. Also GSMNP has lots of rules. You must have a permit to camp here. You must stay in a shelter, unless it is full in which case you can camp beside it. Four spots in each shelter are reserved for thruhikers. After that the spots may be reserved by non-thruhikers. Go potty only in the indicated locations. OK, that’s a pretty good rule. Our third day in we got slapped with some famous ‘Smokies Weather’ and it did a number on me. It rained on our second night and continued raining into the next day with temps in the 30’s all day. While we hiked in this the wind was blowing constantly. This was when I realized that the trail maintenance in the park is somewhat lacking. There are very few drains in the trail so water can gather and run for hundreds of feet at a time. The end result was that we made less than 8 miles on our 3rd day and I wound up in poor shape at the end of it. I fell twice while slogging along the muddy canal. With all the rain and wind blowing and river-trail I was completely soaked. I still went out and gathered firewood. We needed a fire. What I did not know was that rainwater had been running down my back and wicking through the only part of my pack not protected by my pack cover – the part that was in contact with my back. My clothes were safely stowed in stuff sacks inside a garbage bag in the main compartment. My sleeping bag, however, was doing a great imitation of a sponge. After gathering firewood and starting a fire I got out my bag, crawled in and did my best to start drying my clothes and bag with the best tool at my disposal – body heat (the fire was tiny – the wood supply was pitifully small). InProgress took care of cooking dinner which is usually a shared chore. 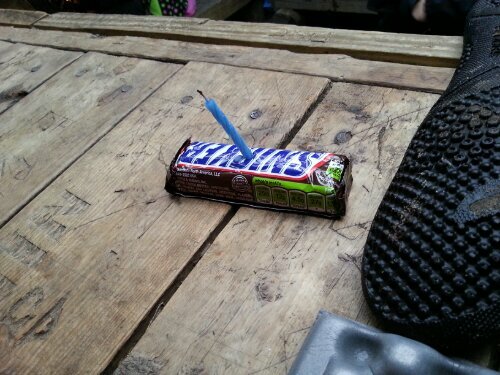 Then she surprised me with a birthday snickers. It was pretty awesome. The weather broke overnight, sort of. Due to altitude the temps are always a bit colder. The food bags had sheets of ice condensate on them from the clouds blowing through. The trees were all also iced over. Our trail experience was different but still negative today. 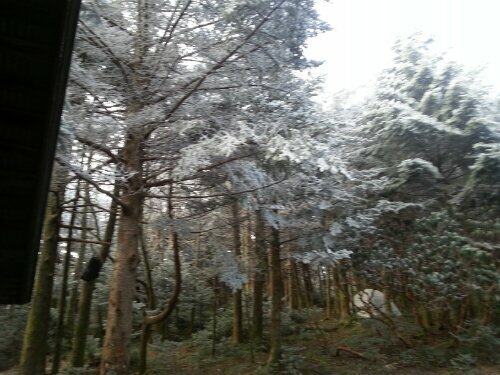 As we climbed the 1000 additional feet to Clingman’s Dome we ran into a frozen non-wonderland. Superslick. 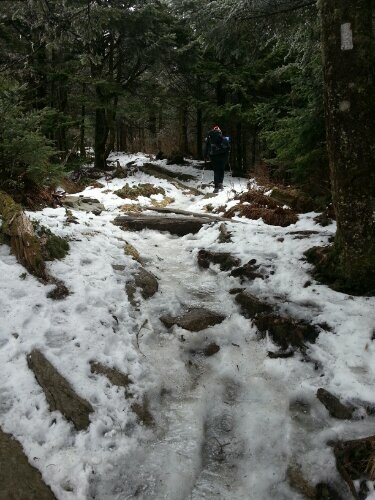 After a couple of slow, slippery, unfun, dangerous miles of this we reached the highest point on the AT. 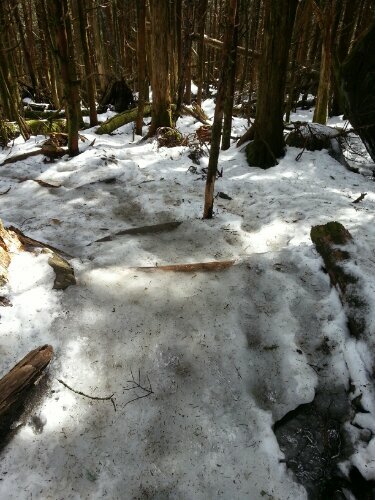 Then we decided not to continue without some spikes to help with the ice. We are in Gatlinburg and the microspikes should arrive tomorrow.